An short history of the Brixton Black Panther Movement which, though short lived, worked to combat racial oppression, police brutality, discrimination at the place of work and the mis-education of black youths and black young people. 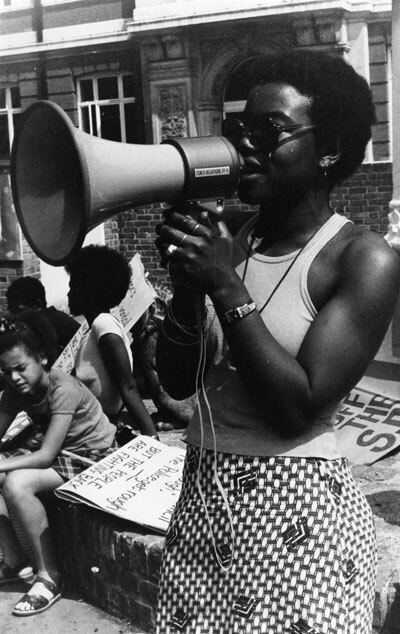 Olive Morris was an active member of the Brixton Black Panther Movement until the group dissolved and reformed into a number of organisations working on specific aspects within the Black struggle. The Black Panther and the Black Power Movements in the UK developed from the work of the Universal Coloured Peoples Association. Several American Black Panthers and radical activists visited the UK and gave lectures in London, including Malcom X (1965), Stokely Carmicheal and Angela Davis (both in 1967). Their message struck a chord in second generation Black youth, and gave impulse to the formation of a local Movement.